This distinctive cat is called "Drucilla". 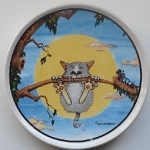 The ceramic plate was designed by Celia Heriot. The words Pet Pride and 1976 are printed in gold ink. The plate is 9" in diameter. 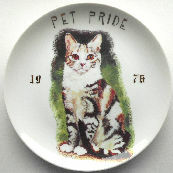 Pet Pride is the name of a brand of pet food. This plate was previously owned but is in good condition. The weight of this one of a kind plate is just over 1 pound.